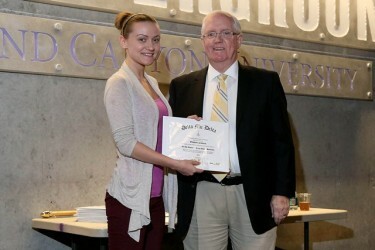 The students inducted this semester into Grand Canyon University’s chapter of a prestigious international business honors society ranged from twenty-something undergraduates to working professionals with new master’s degrees. They were among the 139 Ken Blanchard College of Business students honored Monday at a ceremony in Thunderground to commemorate their academic achievements, placing them into a select group of more than 800 total GCU students inducted into the Delta Mu Delta society since 1996. About 40 inductees attended Monday’s ceremony. 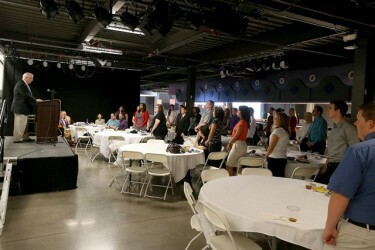 GCU's Delta Mu Delta inductees take the oath at Monday's reception in Thunderground on campus. Delta Mu Delta was founded in 1913 by business professors from Harvard, New York and Yale universities. Delta Mu Delta is the honors society for universities that are part of the Accreditation Council of Business Schools and Programs, the professional accreditation agency for KBCOB. Inductees are recognized as students who stand out at the top of their classes and who embody “earnest, intelligent purpose,” as the society’s website stated. GCU students must be ranked in the top 20 percent of their classes and have a grade-point average of 3.6 or better. Alvin Vulue, a 25-year-old senior, said he felt honored to be among GCU Delta Mu Delta students. He felt his hard work would pay off and that the accolade would be noticed by potential employers. Being accepted into Delta Mu Delta, he said, helps hiring managers recognize a college graduate with a strong work ethic. Vulue added that KBCOB faculty helped him meet the standards for Delta Mu Delta by encouraging students to embrace the school’s values-driven curriculum, much of which is derived from Ken Blanchard’s Christian servant-leadership principles. “Most business schools teach very little on leadership, but GCU drills (leadership) into you on Day 1,” said Vulue, who is scheduled to graduate next month. “All schools give you management, but leadership is a very different and important thing. I’m glad GCU emphasizes that, and that’s one reason I chose GCU,” Vulue said. Sasha Fedkevich receives her Delta Mu Delta pin from KBCOB's interim dean, Dr. Kevin McClean. Dr. Kevin McClean, interim dean for KBCOB, co-advises the campus Delta Mu Delta chapter with Associate Professor Dr. Ronke Oke. McClean said GCU students see the benefits of membership once they head out into the workforce. “There are several benefits, but the most obvious is that this goes on one’s resume for life and it’s something employers are always interested in,” McClean said. Lindsey Fatherly, 21, said receiving Delta Mu Delta honors capped her successful transfer last year from a junior college in her native Kansas. The junior is on track to graduate from GCU next year. The business management major, who is studying with an emphasis in marketing, said Delta Mu Delta honors could help her achieve her goal to study business law at the graduate level. “It shows other business majors that there are rewards for your efforts in the future,” Fatherly said. Dr. Hank Radda, GCU’s provost and dean for the College of Doctoral Studies, and Thomas Skochinski, assistant dean for KBCOB, received honorary inductions into Delta Mu Delta at Monday’s ceremony. Contact Michael Ferraresi at michael.ferraresi@gcu.edu and Cooper Nelson at cooper.nelson@gcu.edu.